Where do I use my Tech Trade voucher code? "Get all the latest information on Events, Sales and Offers when you sign up for the Tech Trade newsletter." 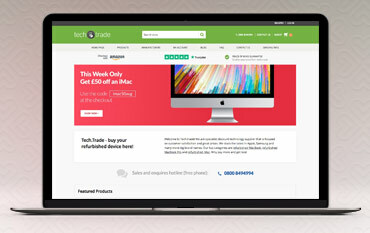 Tech Trade is a leading E-commerce site providing discounted technology products including Apple Mac Tech, Smartphones and Androids from big name brands including Apple and Samsung. Specialising in providing quality refurbished items, you can buy Dell Laptops, LG TV’s, Speakers, Game Consoles and so much more boasting popular brands like Lenovo, Toshiba and Microsoft to name a few. Buying online can also prove more affordable with a Tech Trade Voucher Code or offers which you can find online here at NetVoucherCodes. Payless and get More with Tech Trade and get the most value out of your tech products with an almost new version for a fraction of the RRP. Browse hundreds or products that are ready to be delivered as soon as tomorrow with free delivery when you spend over £100. Whether you’re after the latest Apple Watch, iPad or Samsung Galaxy Note, Tech Trade have got it all awaiting you right now online! According to Tech Trade, there are an abundance of benefits to purchasing a refurbished MacBook with the biggest reason being that it saves money! For a fraction of the price of a Brand New MacBook you can get a ‘like new’ one, saving you a lot of money. Although a refurbished MacBook is pre-owned, Tech Trade ensure that they have been reconditioned in an Apple Factory to meet the exact standards of the company, meaning it’s reformed to ‘like new’ condition. Thorough testing is conducted on the Macbooks before being sold to ensure it’s in the best condition. Each Macbook also comes with a warranty that will fix any defects encountered! Check out the exciting collection today featuring Apple Mac Pro Laptops of all kinds. Samsung is of the world’s leading brands in the technical world and at Tech Trade, they’re proud suppliers of an exciting array of refurbished Samsung goods. Featuring VR Headsets, Hard Drives and Mobile Phone, Tech Trade are continuously updating their selection so you can often find new and exciting products online! Tech Trade is a specialist of discounted technology which focuses on providing affordable prices much lower than shopping direct. Tie these great prices with a Tech Trade Voucher Code from us, you could save a fortune on your next Mobile, Tablet or Laptop. Stocking the biggest and most popular brands in the industry including Apple, Samsung and many more, you can enjoy a huge selection of refurbished MacBook Laptops, Apple iPhones, Samsung Galaxy Android phones, tablets and so much more!